Canyon View is an established 55+ community in Green Valley, Arizona. Active adult homeowners enjoy the community s inexpensive homeowners association fees and no fees to Green Valley Recreation (GVR). Although it s not a part of GVR, Canyon View has a private clubhouse and outdoor amenities. Residents of this age-restricted community in Southern Arizona live vibrant, active lifestyles. There is a calendar full of events, classes, and community activities that allow homeowners to enjoy their favorite hobbies and explore new ones. Homebuyers are drawn to Canyon View s affordable low-maintenance homes in a warm climate. The clubhouse at Canyon View is the social hub of the community. The large multi-purpose room is filled with tables for activities, poker, and billiards. This welcoming facility even has a large catering kitchen for special events as well as a dance floor for classes and parties. The clubhouse is also complete with an exercise room, locker rooms, and a media center with a library. Outside of Canyon View s clubhouse there is a resort-style pool and spa, as well as a large patio and barbeque area. Across the street from the clubhouse, a small park contains horseshoe pits and two shuffleboard courts for some friendly competition. There are 229 residences that encompass the Canyon View community. These homes were built between 1994 and 2007 and offer great low-maintenance living options. Canyon View s homes generally offer between 1,085 and 1,400 square feet of living space with two bedrooms, two bathrooms, and a two-car garage. While the majority of homes within the neighborhood are attached residences, a few were built as detached single-family homes. Both are pueblo-style homes with low-maintenance stucco exteriors, have affordable association fees, and offer single-level living. Residents of Canyon View enjoy plenty of activities that are available in the community. They continually plan fun events and activities in the clubhouse. Clubs like the Red Hats host luncheons and the men s club meet for golf. Staying fit and active is a breeze when attending a ball, dance, toning, Tai Chi, or yoga class. Craft groups can meet to stitch and those who want to socialize can join a card game or attend one of the many community parties. Canyon View is situated in Green Valley, Arizona. Green Valley is an acclaimed retirement destination made up mostly of age-restricted or age-targeted communities. Its location in this established area in Southern Arizona is near two major shopping areas: the Green Valley Village and stores along Duval Mine Road. The library is just three blocks away and it neighbors the Cardondelet Medical Center. 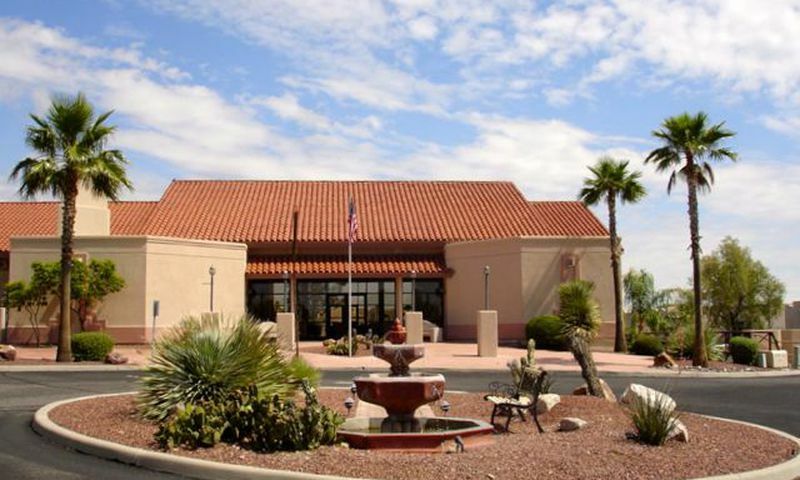 Canyon View s convention location near Interstate 19 makes it easy to visit Tucson and nearby attractions. When traveling even farther is on your agenda, Tucson International Airport is only 28 minutes north. 55+ homebuyers looking for an affordable home in Green Valley without GVR fees should look no further than Canyon View. There are plenty of activities available in Canyon View. Here is a sample of some of the clubs, activities and classes offered here. Canyon View is mostly made up of attached homes. These offer the ultimate in low-maintenance living with two bedrooms, two bathrooms, and an attached garage. Homebuyers can find the perfect resale single-level townhome that ranges from 1,085 to 1,400 square feet in size. Please Note: Floor plans are unavailable at this time. While Canyon View is mostly made up of attached homes, there are a few free-standing low-maintenance residences. Much like the attached homes, these single-level residences offer between 1,085 and 1,400 square feet of living space. Most homes feature two bedrooms, two bathrooms, and low-maintenance exteriors. The few detached homes within Canyon View are a great option for homebuyers looking for a bit more privacy. Please Note: Floor plans are unavailable at this time. Nice, quiet and neighborly. Very nice pool and clubhouse. Canyon View is a nice little neighborhood and the clubhouse here is private, not a part of Green Valley so no sharing! Considering how small Canyon View is, our clubhouse is very nice and there are plenty of things to do and fun activities. The houses here are priced very reasonably too. I enjoy being part of a small community where I know all my neighbors. 55places.com is not affiliated with the developer(s) or homeowners association of Canyon View. The information you submit is distributed to a 55places.com Partner Agent, who is a licensed real estate agent. The information regarding Canyon View has not been verified or approved by the developer or homeowners association. Please verify all information prior to purchasing. 55places.com is not responsible for any errors regarding the information displayed on this website.